That was Sen. Herbert Lehman (D-N.Y.) speaking on the floor of the Senate on May 13, 1952 in opposition to the provision of the Immigration Act of 1952 — now 8 U.S.C. 1182(f) — that has been invoked by President Donald Trump to temporarily suspend immigration from seven countries deemed to be terrorist hotspots. Although an opponent to the measure, Lehman explained precisely and quite clearly what the extent of the grant of power to the president was under the 1952 law, as was originally understood by members of Congress. The law was adopted overwhelmingly. President Harry Truman actually vetoed the bill, and the vetoes were overridden in the both the House and the Senate by the requisite two-thirds majorities. It was a popular bill. The 1952 law put together a fairly strict scheme of national quotas limiting the number of immigrants that could be accepted on a per country basis. As a matter of construction, then, the provision allowing the president to suspend the entry of any and all immigrants into the U.S. was a statutory exception to that scheme — when such a presidential proclamation suspending immigration from that country was in effect. As Lehman emphatically noted, “This is plain authority for the President to shut off all immigration, at any time, or to reduce it at any time, or to shut off immigration from any country, at any time…” Again, “from any country,” even though the law otherwise allowed for a set number of immigrants to be allowed on a per country basis. In effect, the president under the 1952 law could suspend the quotas of the affected nations via proclamation, and when said proclamation was lifted, the quotas would be reinstated. During the debates on the law, both in committee and in Congress, there were many statements of groups testifying in opposition to this very provision of the bill, and they all read it the same way Lehman did, as a broad grant of power to the president to suspend any and all immigration, even in peacetime. Congress even considered to limit this provision to only be invoked during a time of war or national emergency, a proposal Lehman endorsed in his floor speech — and that proposal was rejected with Congress, which ultimately left that part of section 212 unaltered. When the Congress amended the nation’s immigration laws in 1965, it had every opportunity to remove this exceptional grant of power to the president or limit it. That never happened. Section 212, including the presidential power to shut down the border to all immigrants in times when the president deemed it detrimental to the interests of the U.S., was left intact. That is, unless the president has by proclamation decided otherwise to “suspend the entry of all aliens or any class of aliens as immigrants or nonimmigrants,” presumably in exigent circumstances, as the law still allows. 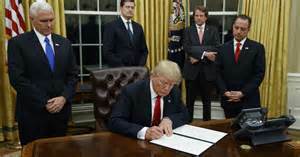 Which is exactly what President Trump has done, blocking immigration from the seven countries, for a 90-day period while the administration puts in place new restrictions on who may enter the U.S. and under what circumstances, as the president has the authority to do under the statute. Extreme vetting is on the way. Under the law, Trump could go much further, shutting down the entire border if he wanted to, but he has limited the travel ban to short length of time, to be replaced by whatever the new policy will be. By leaving in place and not overturning the president’s power to suspend any and all entry into the country, the 1965 law allowed that power to remain an exception to the scheme of regional allotments of immigration. If there is any legal argument against Trump’s policy, it might be that the 1965 statute’s non-discrimination clause would block such a travel ban. And it might, if the 1965 law had removed the president’s power to suspend the entry of any and all immigrants, but it didn’t. When there are two closely related statutes, they must be read consistently. The president’s power to close the border remains an exception to the normal scheme of immigration outlined by law. Congress has had many opportunities to amend and limit or eliminate the 1952 grant of power, and if anything, its only action to date was to expand this section of the law in 1996, by giving the Attorney General to power to suspend an airline’s access to the U.S. if its detection of fraudulent documents is not up to snuff. So, as a matter of law then, textually and based on the original intent of the 1952 law, the travel ban President Trump has instituted is on solid legal ground. Constitutionally, there is practically no argument against the Trump travel ban. As an exercise of his Article II executive power to conduct foreign relations, shutting down the border in a time of emergency or a time of war is pretty much a no-brainer. Nor is there any constitutional right for non-citizens overseas to travel and immigrate to the U.S. If courts uphold centuries of jurisprudence deferring to exercises of presidential power like this, often ruling that such actions are non-justiciable, it ought to stand up to judicial scrutiny. But everyone should also bear in mind that in less than 90 days, the travel ban may in all likelihood no longer be in effect, becoming a moot point very soon. What will come next are the new restrictions on travel to the U.S. that Trump under the same statute has the power to implement. Again, the president can issue whatever restrictions he deems necessary on entry into the country under the law and the Constitution, including any necessary vetting, in pursuit of the government’s primary responsibility to protect and defend the country.